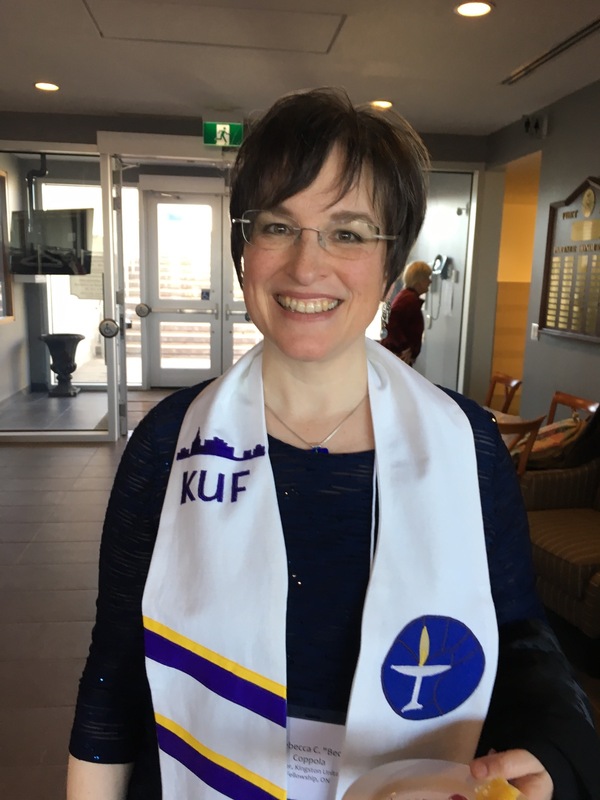 Welcome to the Kingston Unitarian Fellowship website! I love ministry for many reasons, and chief among them is the way in which covenant and community can bring us into deeper relationship with each other and with ourselves. Unitarian Universalism is a covenanted community, which means we are a community grounded in the promises of relationship with one another and inspired by how we hold our shared faith’s principles and sources. Sunday Service is the centerpiece because it is the entire community’s time together. It is the small moments of tradition and ritual each Sunday, when we connect through a single moment, from which we are sent out together into what comes next individually and communally. Which usually starts with a conversation over coffee immediately following Sunday Service! No one of us is complete without the diverse voices of our faith movement. This message about how much we need each other is important and bears repeating, particularly when we disagree. Through covenant we live into the responsibility of relationship, and the necessity of honoring each other’s needs as a community through BOTH deep listening and deep sharing. This idea also plays a part in the great potential of worship and shared ritual — We gather together in communities around the globe oriented to a coexistent approach to faith, religion, and spirituality. Together we are creating something new, with deep roots in something old! In Unitarian Universalist thought we seek to know the interconnectedness of all existence: for me this understanding includes room for logic, reason, and a scientific understanding of life and experience, which I hold as a part of my truth; and for me this also includes the expanse and unknown in the experience of mystery and wonder. Interconnectedness requires relationship and through that we are stronger and can accomplish more. Unitarian Universalists hold a great diversity of belief, and we look to 7 principles and 6 sources specifically, plus our own rich history, to inform our explorations of living into community. Some years ago I began adding a 7th source: the words and deeds of Unitarian, Universalist, and Unitarian Universalist writers, thinkers, teachers, ministers, and inspiring voices throughout our rich story. A native New Englander, I moved to the Front Range of Colorado to study at Naropa University in 2011. During the 2014-2015 year I served as the Intern Minister at Jefferson Unitarian Church in Golden, CO, and during the 2016-2017 year I served a multi-site hospital in north-metro Denver as a Chaplain Resident. I was also an Affiliated Community Minister at the Boulder, CO church for the 2016-2017 year, and was deeply involved in the church for a number of years before that. Since I was young I have been exploring my understanding of life and the universe, and I stepped into intentional spiritual seeking by the age of eighteen. During those early years I had other careers in Office Management and in Film/Public Broadcasting, and at the end of the day always came back to something very different. A lifelong pursuit of and love for spiritual practice informs my ministry as much as my lifelong pursuit of education and learning, and I look forward to sharing my approach to contemplative and curious living with all whom my ministry is destined to serve. My theology is that of a natural pluralist, in the usage of the scholar Diana Eck; as a person formed with this naturally pluralist understanding of faith I could probably make myself fit in a number of places, and until finding my way into life as a committed Unitarian Universalist I had not found a spiritual home for myself that allowed every aspect of me to be present. Love has always been the answer to the questions I’ve asked, and the journeys I’ve embarked on. I hope that you will choose to become a part of the UU story with us, and perhaps find the answer to the questions you’ve been hearing!